The Arduino Zero is a maker-friendly development board with Atmel’s Embedded Debugger (EDBG), which provides a full debug interface without the need for additional hardware. The default configuration can be found in the Kconfig boards/arm/arduino_zero/arduino_zero_defconfig. The Arduino store  has detailed information about board connections. Download the Arduino Zero Schematic  for more detail. The SAMD21 MCU is configured to use the 32.768 kHz external oscillator with the on-chip PLL generating the 48 MHz system clock. The internal APB and GCLK unit are set up in the same way as the upstream Arduino libraries. The SAMD21 MCU has 6 SERCOM based USARTs. One of the USARTs (SERCOM5) is connected to the onboard Atmel Embedded Debugger (EDBG). SERCOM0 is available on the D0/D1 pins. The SAMD21 MCU has 6 SERCOM based SPIs. On the Arduino Zero, SERCOM4 is available on the 6 pin connector at the edge of the board. 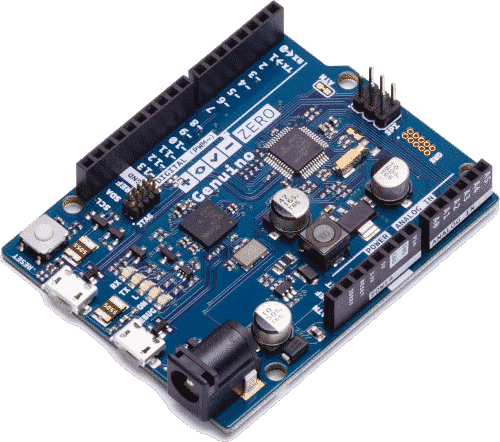 The Arduino Zero comes with a Atmel Embedded Debugger (EDBG). This provides a debug interface to the SAMD21 chip and is supported by OpenOCD. Connect the Arduino Zero to your host computer using the USB debug port.